The Princess of Wands represents the Earth in the element of Fire, far from the Queen's depth and the Prince's Air. She's the Fire's daughter, with all the flaming energy of the Knight, unaffected from deeper emotions. The only heritage from her mother is the good memory for insultings and the thirst for revenge. 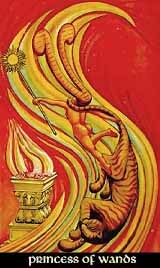 Though, while dancing in the flames, the Princess of Wands has her own beauty with her unsatiable hunger for life and her endless, powerful energies. Her passion is hot, explosive and fast, burning down the object of desire and forgetting about it as soon as a new one comes in sight. Almost like Bizet's Carmen, she's irresistable in her seductive carelessness, in all her lust and anima. At the shadow side, the Princess of Wands can lack all true warmth of the heart, faithless and self-indulgent, theatralic and unable to feel real compassion and understanding. At the worst, she can sink down in pure greed and cruelty, too cold and numbed to recognize the own emotional poverty and emptiness.